A Bitcoin ATM (also referred to as a Bitcoin kiosk) is a physical device used for withdrawing Bitcoin and other cryptocurrencies as cash. Users can also use Bitcoin ATMs to buy Bitcoin with money and have the purchased cryptocoins sent to their software or hardware wallets. Bitcoin ATMs don't generally interact with a traditional bank systems like a regular ATM and instead send and receive Bitcoin and other cryptocurrencies from a designated exchange service. Bitcoin ATMs allow users to convert their Bitcoin into traditional real-world money. They can also be used to purchase Bitcoin with money and have the cryptocoins transferred to their selected Bitcoin wallet. Many Bitcoin ATMs also support other cryptocurrencies such as Litecoin and Ethereum. What Sort of Bitcoin ATMs Are There? 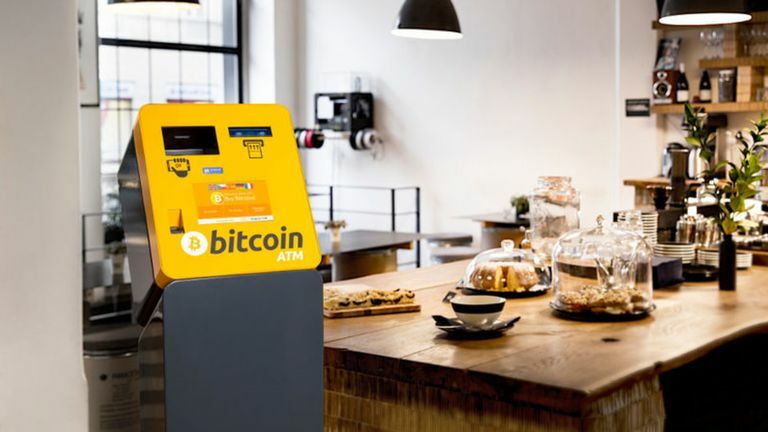 Bitcoin ATM manufacturing is an industry that continues to grow and there are numerous companies that either create Bitcoin ATMS or offer similar Bitcoin-to-money conversion services. Two of the biggest Bitcoin ATM companies are Genesis Coin and General Bytes. Both of these companies manufacture and sell several different Bitcoin ATM models to a variety of business types in the United States. General Byte also exports machines to other countries as well. As with traditional ATMs, Bitcoin ATMs will vary slightly by manufacturer but the general functionality remains the same. Some will also support other cryptocurrencies in addition to Bitcoin. General Byte ATMs support the selling and buying of Litecoin, Ethereum, Monero, Dash, Dogecoin, among others. By far the easiest way to locate a Bitcoin ATM is to use Coin ATM Radar, a free online tool that lists Bitcoin ATMs in over 60 countries around the world. All you need to do is visit the Coin ATM Radar website and search for a location using the embedded Google Maps widget. The map on the main page automatically detects your current location and displays any ATMs that are near. Tip: Make sure to click on an ATM location on the map to view its fees and operation limitations. Some Bitcoin ATMs will only allow for the buying of Bitcoin while others have both a buy and sell functionality. While the steps for using a Bitcoin ATM may vary depending on the machine's manufacturer, the process for exchanging Bitcoin for cash will usually look something like this. Select the Sell Bitcoin or Withdraw Cash option from the main screen. Enter the amount of Bitcoin you wish to sell for cash. Tip: A fast way to calculate how much Bitcoin is worth in dollars is to ask your mobile device's digital assistant. For example, "Hey, Cortana. How much is $100 in Bitcoin?" The Bitcoin ATM will then either display a QR code on the screen or print one for you on a paper receipt. Open your Bitcoin wallet app on your smartphone, scan the QR code and send the required amount of Bitcoin to the address given. After the transaction is processed, the Bitcoin ATM should expel the requested money immediately or it may ask you to click on a Redeem Ticket option and scan your paper receipt that you were given. After your receipt is scanned, it should then give you your money. There are a couple of important factors to keep in mind when using a Bitcoin ATM. No Cash Availability: Due to the popularity of Bitcoin ATMs as a method for converting cryptocurrencies into traditional money, the devices can often run out of money and as a result will temporarily disable the withdrawal feature. If planning to use a Bitcoin ATM located within a business such as a convenience store, it's recommended to call ahead and check with staff to make sure money is available. No Refunds: Because of the nature of cryptocurrencies and the fact that they aren't managed by traditional banks or businesses, any transactions made via a Bitcoin ATM are irreversible. It's incredibly important to double or triple-check that your wallet address is correct when buying Bitcoin and other coins. If you send the cryptocoins to the wrong address, there's no way to get them back. High Fees: Bitcoin ATMs can be convenient but they are usually much more expensive than using web services such as Coinbase and CoinJar which can convert Bitcoin into cash and deposit it into your bank account directly. Bitcoin ATMs can charge conversion fees that are much higher than most and have also been known to convert Bitcoin to cash at lower rates than online exchanges.